We generally consider bug spray to be our friend when it comes to defending ourselves from those pesky creatures that cause itchy bites and ruin any possibility of Summer outdoor fun, but there are a few important reasons why you may want to think twice before slathering it all over your skin. Plus, making your own is just as effective, and as a bonus it smells lovely while nourishing and healing your skin at the same time! The short answer is that commercial sprays are full of synthetic chemicals that are proven to have negative effects on human health. The most notable repellent chemical is N,N-diethyl- m-toluamide, also known as DEET. This chemical became widely available after it proved to be an effective insect repellent for soldiers during World War II. Today it still remains a preferred defense, especially when traveling to areas where the risk of insect-borne diseases is high. But, if you are lucky enough to live in an area where mosquito bites do not pose severe health risks, even the EPA and other medical associations do not recommend the use of Deet on a daily or consistent basis. The Pesticide Information Project headed by some of the best U.S. universities has concluded that Deet is quickly absorbed by the skin and distributed to all organs including the brain and nervous system. In their laboratory studies on a variety of mammals (like us!) they found the synthetic chemical to be neuro-toxic, causing neurological and behavioral malfunctions. Research also shows that Deet disproportionately affects children, and there are documented cases of children suffering irreparable brain/neurological effects after prolonged Deet exposure. So why risk the possibility of exposing ourselves and our loved ones to such chemicals when there is an all natural alternative that’s actually good for our skin and takes literally seconds to make? Mosquitos and other pesky little insects generally don’t like citronella, geranium, lavender, lemon eucalyptus, peppermint, rosemary, thyme, and a few others. Any combination of these is effective in a ratio of about 20 drops per ounce of carrier liquid. Below is a recipe I made to protect even the most targeted mosquito magnets (like me! ), and I also chose the ingredients based on their beneficial properties for skin health and beauty that you can find below. Put it all in a fine spray bottle and give it a good shake. Since it is made of natural and volatile active ingredients, it requires more frequent applications than the commercial stuff. You should reapply it about every hour to maintain its potency. Substituting witch hazel with a carrier oil may help the spray last longer on your skin, just remember that some oils may increase the risk of sun burns and sand/dust stuck to your skin. My favorite oil is jojoba (which is technically a wax), and I talk about why it is the absolute best for your skin here. I would advise to not put any essential oils (and especially Deet products!) directly on the skin of infants and children under the age of 3. Instead spray objects, walls, or any cloth that is near them to repel insects. 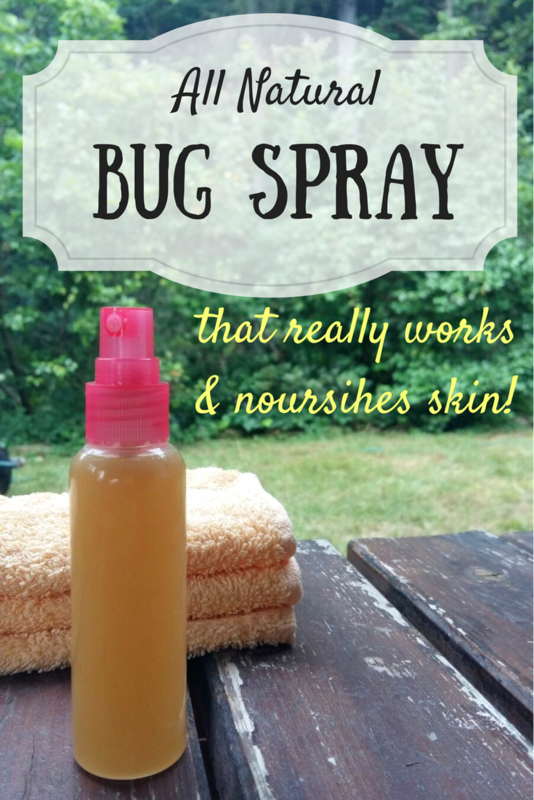 Remember to shake your natural bug spray before every use. Essential oils tend to separate when at rest. Whenever possible, store the spray in a cool, dark place, but it should last at least 3-4 months, or as long as the essential oils maintain their scent. 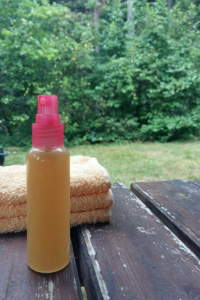 It’s commonly known for its astringent properties that improve skin tone, reduce acne and skin inflammation, and can soothe insect bites. It can be used both on your skin to improve its appearance, or it can be used in the home as a natural cleaner. The list of witch hazel’s beneficial properties is endless, but I’ll limit my comments to this: it’s just a great gift from nature. It has antifungal and antiseptic properties that protect the skin and improve its appearance. Citronella is also a natural anti-inflammatory that can soothe any bites or sore areas, as well as provide relief for achy joints. It’s scent is often used in aromatherapy to promote relaxation, reduce stress, and facilitate sleep. It’s been used since ancient times to treat acne and skin inflammation. Today it has been recognized to also facilitate blood circulation and wound healing, as well as being a potent stress reducer when used in aromatherapy. As one of the most used essential oils, it has antiseptic, antifungal, anti-inflammatory, and wound healing properties ( it’s my go-to EO for minor skin burns, too). It’s scent has the special ability to give you energy when you need it and calm you down when you’re trying to relax.